I couldn’t have picked a better morning to head down to Deerfield Lake and go paddle boarding. The sun was just breaking through the clouds when I pulled up to the Lake. There was barely any wind and the lake looked like glass. It was such a beautiful morning I felt like singing Morning has Broken just like Cat Stevens, but I just hummed it instead – didn’t want to scare away the wildlife. 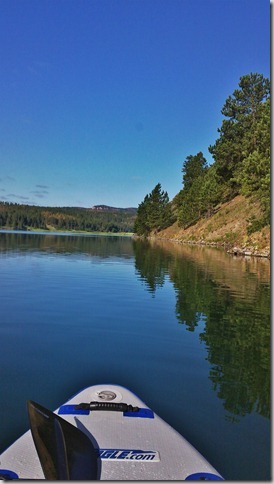 I hope to get my paddle board out on most of the Black Hills Lakes this summer and now I have one more under my belt. I never would have though of the Black Hills as a place to use a paddle board, but the lakes are just perfect for it. Deerfield is a good sized lake at 435 acres. 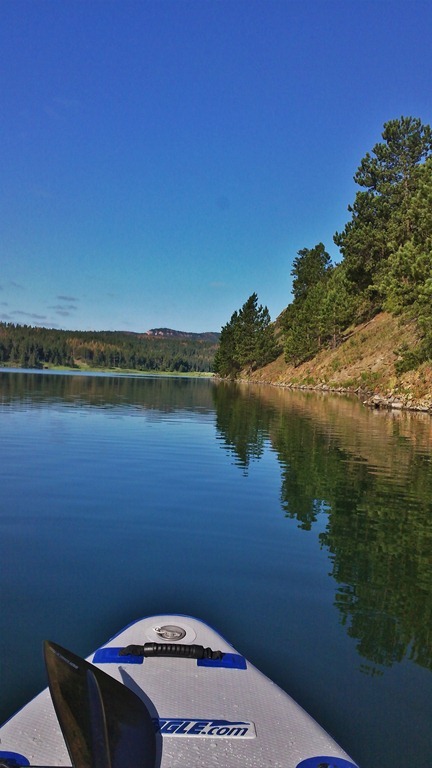 It is also a no wake lake, max boat speed is 5 miles-per-hour – perfect for paddle boarding, kayaking or canoeing. The water is so clear that in many spots you can see the bottom of the Lake. The paddle board gives an up close and personal view of the water, it really is a unique experience. I have only had my SUP (stand up paddle board) about a month, but have really been enjoying it. I took it out to Roubaix Lake a few times, Sheridan Lake once and even tried it in Mitchell Lake when we were visiting family and friends. I bought an inflatable board. It works great because I can keep it in the trunk and it is there when ever I want it. No worrying about strapping it to the top of the car. It really is convenient. If you are down in the Deerfield lake area and have some extra time, head up to the Flag Mountain Lookout for great views of the area. And, if you’ve worked up an appetite a trip to Alpine Inn may be in order. If you plan on exploring the area be sure to have a good map like National Geographic Map: Black Hills, Northeast #751 . The lake access points are clearly marked on the map and it will make navigating the area a breeze.